Oakland Mayhem 2014: Vote for Us! http://youtu.be/KIDvvqgDvI8 – BETTER PREDICAMENT VIDEO TO SEND IN! The nomination period for Oakland Mayhem 2014 (called the Oaktown Music Festival last year) closes September 30, 2014! Winning Best of Oakland and a bunch of great prizes is only one little step away! It only takes one nomination to be in the running; and as of right now, just a few more nominations by Justin Ancheta Band fans could snag us the People’s Choice Award! In addition, the top 15 most nominated songs or videos along with 10 producers’ picks (for a total of 25 finalists in each category) will go to our all-star jury of local music professionals who will score each track, the highest scores become the winners. 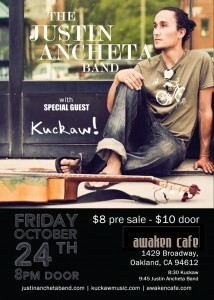 We are getting ready for an awesome show at one of our new favorite venues: Awaken Cafe in Donwtown Oakland. Thanks for all of your support through this growing time! We are hard at work daily at Soul Graffiti Studio’s, and plan to have a new 5 song EP completed in February for release next summer. For people that are supporting at multiple shows a month, please let us know who you are and we will send you a sneak peak link to the coming release even before the press get their hands on it. As always, we love you lots, wherever you are.